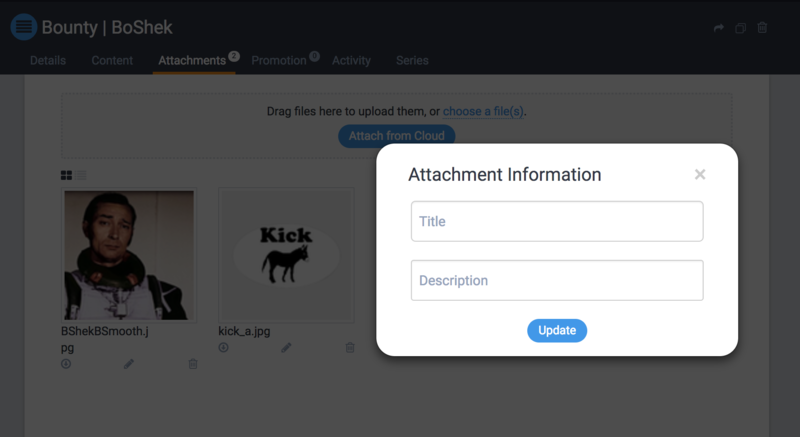 This article discusses the features and best practices of working with images and other file attachments within the DivvyHQ Sandbox > Attachments Tab and the Sandbox > Content Tab. DivvyHQ's Sandbox is designed to be a secure container that houses all details and assets associated with an individual content item. Content producers can attach files of any type and size from various cloud storage platforms (ex: Dropbox, Google Drive, Box) or direct upload any type of file, provided each file is under 200mb. The Attachments Tab can be accessed by opening a content item then clicking the Attachments Tab. Files can be uploaded either by dragging and dropping files (from your file browser) into the designated upload area or by clicking the choose a file(s) link. Multiple files can be uploaded at a time. Once uploaded, each file will be referenced with a thumbnail, download button, attachment meta data (via the pencil icon), and a trash can icon for deleting. Additional meta data, including a title and a description, can be added by clicking the pencil icon/more link. Download a file by clicking the download button (a circled down arrow icon). There is no limitation on the number of files that can be stored within a content item. The only limitation is the 200mb file size limit per uploaded file. There is no file-size limitation when files are attached from cloud storage platforms. Divvy will remember the view preference you last selected, and will use that as your default moving forward. If you are wanting to insert an image within the body of your content, please note that there are differences between Divvy's WYSIWYG (What You See Is What You Get) editor and other CMS editors that are built for presenting a public web page (Ex: Wordpress). For starters, DivvyHQ and Wordpress actually use the same editor called TinyMCE. TinyMCE is designed to manage web-based content, which is output to HTML (behind the scenes). The difference comes with how and where your images are stored and referenced within the HTML code. Displaying the image on your screen, positioned where you intended it to go. When you publish that web page, all your content is there and when the browser comes across the URL for the image, it knows to go fetch it on your web server and present it to the viewer. Now...Here's how and why DivvyHQ is different. Even though you might be creating a blog post or web page content within our platform, Divvy is designed to be a secure platform for producing and routing content for approval, not final presentation. You may need to create multiple versions of an image before it is ready for the public. This is why we have our "Attachments" feature (discussed above) so you can attach images/files/media to your content item and route them through any required review or approval steps. If you still want to embed an image into the content, you can, but your image needs to be hosted on a public web server and the "Source" would be the URL of it's location on the web (not your computer's file system). 1. 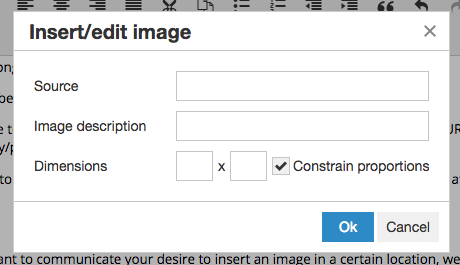 Upload your image to a publicly hosted server (ex: the Wordpress media library), copy the URL, go back to your content item in Divvy, click the insert-image button and then copy/paste this into the Source field. 2. Upload the image to your DivvyHQ content item, copy the url from the preview image after attaching it, click the insert-image button and the copy/paste the into the Source field. Assuming you still want to communicate your desire to insert an image in a certain location, without inserting the image source code, we suggest just including a little reference snippet (like below) within your content.